How will you spend the last week of 2017? With Christmas and New Year’s Eve almost back to back in the last week of the year, you’re probably expecting to see a fairly empty office as colleagues go on leave for the holidays. However,Â according to Robert Half’s holiday survey, workers in U.S.Â will not leave work very far behind â if at all â during Christmas week. In fact, of the 1,000 people surveyed throughout the U.S., 18% of workers had planned to work the entire week of 25 December, and of theÂ 67% who are planning to take at least part of the week off, 64% said they will check in with the office while they’re out. That said, a third ofÂ respondents will still have the entire week offÂ due to theÂ office holiday shutdown (61%) – of these workers,Â 79% of them noted their firm pays employees during the closure. As for those who are planning to work, 81% expected to be at least somewhat productive. ALSO READ:Â Checklist: Will you meet these 12 personalities at your office party? 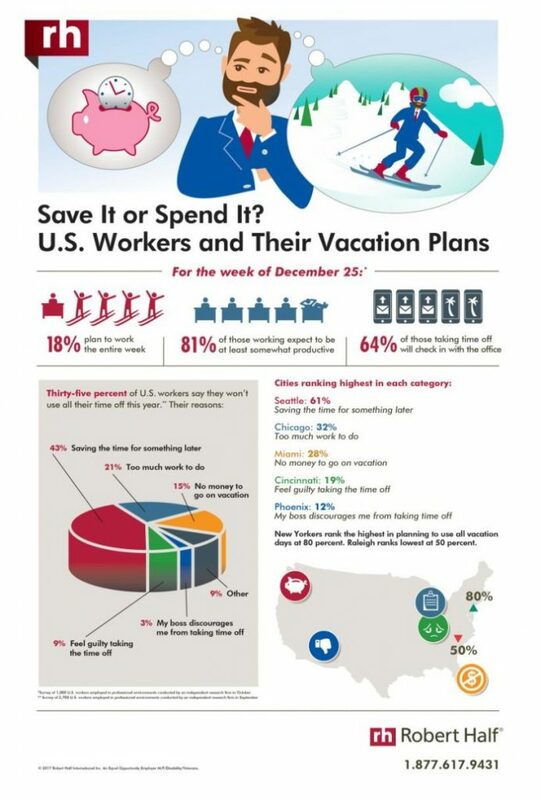 Digging into the reasons why workers choose to save their vacation days, aÂ separate Robert Half survey of 2,700 people from 27 major U.S. cities found that 35% said they won’t use all their time off this yearÂ for varying reasons. These include saving the time for something later (43%), having too much work to do (21%), having no money to go on vacation (15%), feeling guilty taking the time off (9%), and a boss who discourages them from taking time off (3%). In line with that, Paul McDonald, senior executive director at Robert Half, offered some tips for workers and managers on how to make full use of their vacation time – because once you lose them, you may never get them back. Instead of emailing workers with high vacation balances to remind them to take time off, managers should have conversations one on one. In doing so, they may uncover the reasons why they’re not taking time, and help rearrange priorities or get extra help. Employees who never see their boss take time off or truly unplug from work may find it difficult to step away from the office. Don’t make working around the clock the norm for your team. Check your time off balance and your firm’s rules on unused vacation days. “Use it or lose it” policies differ according to state and local laws, as well as individual employer policies. Don’t make assumptions or find out the hard way that you lost valuable time. Think twice about your rationale for skipping out on vacation. Employers offer vacation time for good reason. You’re less effective at work and have a higher risk for burnout if you don’t take a break. If you don’t have funds to take a trip, you can still relax and recharge at home with a staycation. So, how will you be spending your time off? For the team at Human Resources, this week marks the last work week of the year and we will be back in full force on 2 January 2018. In the meantime,Â for the next two weeks, we’ve rounded up newsletters containing all the yearâs top stories for you to enjoy as we head into an exciting new year. Have you done anything impressive in the area of recruitment and talent acquisition? Of course you have. Donât keep it a secret, enter it into the Asia Recruitment Awards! Position your company as an employer of choice at the Asia Recruitment Awards – entries open now!